Fly ash is an industrial waste. Coir dust is a by-product of coir fiber production. A novel low cost hybrid polymer composite, using coir dust and fly ash particle reinforcements is proposed in this paper. Investigation of the dielectric behavior of this hybrid polymer composite proves its potential as a marketable product. Individual compacts of coir dust, fly ash, and a mixture of both were also prepared for comparison with the hybrid polymer composite. Hand lay-up method was adopted for preparation of the compacts. The novel hybrid composite has the lowest porosity, homogeneous surface structure and greatest interface bonding when polymer is used as the binder. Its dielectric properties are studied through experimentation. With an increase in frequency of the applied signal, the dielectric constant of the composite decreases due to dielectric relaxation. Also, dielectric loss of the hybrid composite shows a stabilizing trend with increase in frequency of the applied voltage. The hybrid polymer is found suitable for high frequency electronic applications as a dielectric material. sectors ((Lokeshappa B and Anil Kumar Dikshit, “Disposal and Management of Fly ash”, International Conference on Life Science and Technology, IPCBEE , Singapore, Vol.3 , Pg. 11-14, 2011 )). Its utilization in industrial or market sector may bring economical and ecological benefits, and impart technological developments. Compositionally, fly ash is a mixture of SiO2, Al2O3, CaSO4, and un-burnt carbon. Coir dust, a bio-waste, is a by-product of production of coir fiber, and can be useful for setting up an important industry in most countries where there are plenty of coconuts. Coir dust is a spongy, peat like residue obtained from the processing of coconut husks for coir fiber. It consists of around 2% - 13% of cork like particles ranging in size from granules to fine dust ((“Coir dust A proven alternative to peat”- A report by Dr. Geoff Cresswell )). great interest to researchers ((Jeremias de S. Macedo, M. F. Costa, Maria I.B. Tavares, Rossana M.S.M. Thire, “Preparation and characterization of composites based on polyhydroxybutyrate and waste powder from coconut fibers processing”, Polymer Engineering & Science, Volume 50, Issue 7, pp. 1466-1475, July 2010)) , ((Nadiya Bihary Nayak, S.C.Mishra and Alok Satapathy, “Investigation on Bio-waste Reinforced Epoxy Composites” Journal of Reinforced Plastics and Composites; Online First, February 25, 2009 )). Further mechanical properties of epoxy based fly ash composites have been studied ((M.Singla,Vikas Chawla, “Mechanical Properties of Epoxy Resin-Fly ash Composite”, Journal of Minerals and Materials Characterization & Engineering, Vol.9, No.3, pp. 199-210, 2010 )). Presently, much research attention is given to use such materials for capacitor dielectrics, insulation, encapsulation, multilayer ceramic chip, printed circuit boards etc. ((Dielectric: Encyclopedia Britannica)) , ((www.thetestlab.com/data/nov96.pdf)) , ((Lee W. Ritchey, Speeding Edge, “A survey and tutorial of Dielectric Materials used in the manufacture of Printed Circuit Boards”, Circuitree Magazine, November 1999 )) . Fly ash based composite and bio-fiber based composite exhibit a low dielectric constant and stabilized dielectric loss at high frequencies of applied field, and hence are suitable for electronic applications ((S.C.Mishra and H. A Reddy, “Evaluation of Dielectric Behavior of Bio-Waste Reinforced Polymer Composite”, Journal of Reinforced Plastics and Composites. Vol. 30(2), pp. 134 - 141, 2011)) ((Muhammad Akram, Athar Javed and Tasneem Zahra Rizvi, “Dielectric Properties of Industrial Polymer Composite Materials”, Turk Journal of Physics,Vol. 29, Pg. 355-362,2005)) ((S.C. Raghavendra, R.L.Raibagka, A.B. Kulkarni, “Dielectric Properties of Fly ash”, Bull. Mater. Sci., Indian Academy of Science, Vol. 25, No. 1, pp. 37-39)) . Development of a hybrid polymer composite retaining both types of characteristics is considered to be an active field of research. particles reinforced composites and emerge as a viable alternative to the existing polymer composites. electric field, design flexibility, and hence can be a highly valued commercial product. 1. The processing of coir dust from coir fiber extracted from coconuts. 3. The compacts were made applying 5 ton pressure in a Uni-axial Pressing machine. 4. Adopting the simple hand lay-up method for making hybrid composites by using the waste materials as reinforcements to an epoxy resin matrix (procedure described below).As binding of particulates of fly ash and coir dust is required to form a bulk mass, Epoxy was used as the binder/matrix material in the fabrication of proposed hybrid composite. 6. Measurement of hardness of the hybrid composite using a Micro hardness tester. 7. Study and analysis of the surface morphology of the compacts made using coir dust, fly ash, a combination of coir dust and fly ash (50% coir dust and 50% fly ash) and also for the hybrid polymer composite sample using a high precision Scanning Electron Microscope (SEM). 8. Observations and analysis of the dielectric properties( dielectric constant and dielectric loss) as a function of frequency of applied electric field (100 Hz - 1MHz) using a PC based dielectric interface equipment. Raw Materials used: Epoxy LY 556 (common name- Bisphenol A Diglycidyl Ether) was used as the matrix material in the fabrication of proposed hybrid composite. The hardener used was HY951(IUPAC Name- NN0-bis (2-aminoethylethane-1, 2-diamin). Epoxy resin and hardener were mixed in a ratio of 10:1 by weight. Coir fiber was processed it to form coir dust. Fly ash, collected from the nearby steel plant was utilized for the hybrid polymer composite fabrication. Procedure followed: The hybrid polymer composite was developed as follows. Both of the waste products (50% coir dust and 50% fly ash) were mixed with the epoxy resin (polymer binder) in a glass beaker with the help of suitable glass stirrer. Proper stirring was done to mix the reinforcing agents with the polymer binder at room temperature. After 10 minutes of constant stirring, polymeric reaction started, which was noticed by a temperature rise. Then the solution was poured into a suitable mould to fabricate a plate-shaped hybrid composite. This process is called casting. After curing for approx. 24 hours at room temperature, the casted slab of hybrid polymer composite was collected from the mould. Disc shaped test samples (12 mm diameter and 2.5 mm thickness) of the composite were prepared by cutting and polishing. The Coir dust compact, fly ash compact, a combined coir dust and fly ash compact were made, for comparison with the hybrid polymer composite, using a Uni-axial Pressing machine with 5 ton applied load. Test specimens of suitable dimensions were prepared from the compacts for testing. The samples of compacts and the hybrid composite prepared are shown below. A Vickers’s Micro hardness tester was used for Hardness measurement of the composite sample. In this test, a load F= 0.3 Kgf was considered and Vickers’s hardness number was calculated by using the formula. HV=0.1889 F/L² and L=(X+Y)/2 in mm, where F is the applied load, L is the diagonal of the square impression (mm), X is the horizontal length (mm), and Y is the vertical length (mm). Hardness of the hybrid composite was found to be 19.7 HV, which was more compared to that of the polymer binder alone. The hardness measurement is shown in the Fig. 1 below. To study the surface morphology of different compacts using coir dust, fly ash, a combination of coir dust & fly ash and the hybrid polymer composite, the following test was carried out. 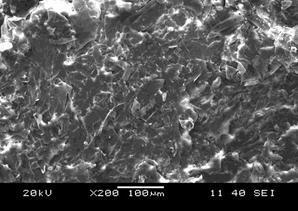 The surface morphology of the composites was examined with JEOL T-330 Scanning Electron Microscope. Samples of the compacts and the hybrid composite were coated with 60 A° thick platinum in JEOL sputter ion coater for surface conductivity and then observed under SEM. Scanning electron micrograph are shown in the following figures. (Fig 2 to Fig 5). Figure 2 shows the surface morphology of the compact made from coir dust. Some amount of inter particle void spaces are present and the particles are multifaceted type. Figure 3 indicates the microstructure of compact made with a combination of 50% fly ash and 50% coir dust. This shows more amount of porosity in the compact. Bonding of fly ash particles is more prominent than that of the bonding at the interface of coir dust and fly ash, which implies an increased amount of porosity of the compact. Figure 4 demonstrates a compact made with fly ash only. Porous regions are homogeneously distributed and vary from region to region throughout the surface. Poor interface bonding between fly ash and coir dust is evident from the crack propagation along the boundaries of fly ash and coir dust. Figure 5 shows the composite made with blending epoxy resin with coir dust and fly ash in equal volume percentage. Here some clear globular regions are observed. The interface bonding of coir dust and fly ash particles is found to be superior to that of all previous cases as there are less interparticle void spaces and crack. This composite has the lowest porosity, most homogeneous surface structure, and greatest interface bonding as compared to previous samples. Formation of cavities is noticed, which may be due to trapping of air bubbles during stirring. A study of the important electrical properties (such as dielectric constant and dielectric loss) of the coir dust, fly ash, mixed (coir dust & fly ash) compacts and hybrid polymer composite as a function of the frequency of an applied electric field was carried out, and is described below. A dielectric material is an electrical insulator that can be polarized by an applied electric field. The dielectric constant of a material depends upon the degree of polarization of its molecules, which is determined by different contributions such as interfacial, dipole, atomic and electronic polarizations ((Tony Blythe and David Bloor, “Electrical Properties of Polymers”, Cambridge University Press, 2nd Edition )). Interfacial polarization influences the dielectric properties (at very low frequencies) and usually decreases with increasing frequency. Dielectric properties like dielectric constant and dielectric losses were measured with Solartron 1260 Impedance analyzer, connected with PC based data acquisition system as shown in Fig. 8.
alternating electric field. The applied electric field creates a dipole moment as shown schematically in Fig 7. This electric field produces polarization in the sample, which oscillates at the same frequency as of the applied electric field, but has a phase angle shift . This phase angle shift was calculated by comparing the applied voltage to the measured current, which is separated into capacitive and conductive components12, 14, 16 .The experimental data given in Table 1 and 2 were collected and plotted in Fig 8 and Fig 9 respectively. It is observed from Fig. 8 that the dielectric constant (at 104 Hz frequency) is maximum for pure fly ash sample and minimum for coir dust. But when coir dust and fly ash are combined together, the dielectric constant drops down. For the hybrid composite with epoxy matrix, the dielectric constant value and dielectric loss value initially decreases and attains a steady state with increase in frequency as shown in Fig. 9. This may be the fact due to; (i) dielectric behavior is dependent on porosity, (ii) material properties and also on (iii) interface bonding in case of composite materials. So in this study the materials used have many diverse physical and mechanical properties. However, it was found that making a composite with these wastes and a polymer binder is best suited for providing good mechanical strength without sacrificing desired dielectric properties. The developed hybrid composite results in a performance unattainable by the individual constituents. decreases depending on the reinforcement content and types of reinforcement. Low dielectric constant and stabilizing dielectric loss of the novel hybrid composite are beneficial in electronics industry ((P. S. Ho, J. Leu and W. W. Lee, L, “Low Dielectric Constant Materials for IC Applications”, Springer Series in Advanced Microelectronics, 2003, Volume 9, 1-21)). The developed hybrid composite offers advantages of renewability and biodegradability as comparable to synthetic polymer composites in the use of capacitors 12. As the composite is made using industrial by-products and bio-waste materials from local resources, its cost is less compared to other polymer composites available today5. This can further open up a new frontier for industrialization at rural sectors. Coir dust and fly ash mixed polymer composite can have the potential for use not only in household applications but also for electronic industries. Hence, detail study of mechanical properties, thermal conductivity, chemical resistance etc. need to be carried out in order to explore various applicability of such material. Optimization of the amount of reinforcements (coir dust and fly ash) in the hybrid polymer composite can be attempted to further improve its performance. I express my deep sense of gratitude to Professor S.C. Mishra, Ph. D., Head, Materials Engineering Center, Department of Metallurgical and Material Engineering, NIT, Rourkela for his supervision and constant inspiration during my summer project work. I am also highly indebted to my school principal Mr. Sidhartha Ratha and my parents for their constant encouragement and support. Great job man,hope it finds usage in industries. i think its great. hope will do some magic in industries.